My life (and therefore blog) currently seems in a constant state of loading. The knees always bent and arms back, ready to propel forward. Cue the setback and then start to reload the pattern. 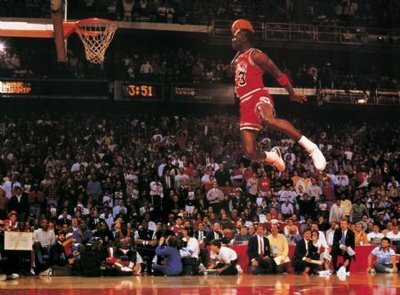 Well today I’m Air Jordan. No one really appreciates deadlines. They push us towards a median and force us to choose a route. Just the way your instincts take over when you are driving and don’t know where you are going but you will always pick one direction or another. No matter which way you choose, it always is a better option than crashing into the median. I have been weighing my options and thinking about going back to school. My confidence in this decision has been as unsteady as my left knee. However, based on the theory that no one ever feels comfortable when they upset their life plans, I have decided this is my best route to pull a last minute swerve towards. What solidifies a decision more than making it non-refundable? My fellow squatters and trotters I am going back to school. I will still be training at the gym and hopefully adding more to my schedule without sacrificing too much. That is of course very flawed logic but I won’t really admit it until the scheduling Gods crush me. My confidence in this decision is now really strong because I am more excited than a first grader at the thought of buying lined paper and a binder. I am completely old school and I don’t plan to change anytime soon. A good old pen and paper never just crashes and erases what you wrote, and the distraction of doodling hardly compares to the vast timewasters built into the internet. I just need my neighbour to take my picture with a big toothy smile and my thumbs wrenched into my backpack straps.